We are not currently running an Alpha Course but please see below and get in touch if you are interested in being part of the next one. 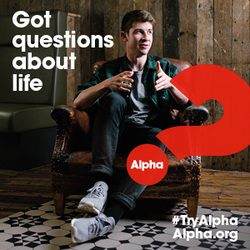 Alpha is an opportunity to explore life and the Christian faith in a friendly, open and informal environment over 10 evening sessions. When running we normally gather at the Church Room in North End to begin with puddings (so don't have one with your dinner!) before watching a video which explores the big issues around faith. This is followed by an opportunity for discussion with others in the group about the week's topic. If you would like to come along then please get in touch with us. Just let us have your basic details and someone will give you a call to tell you more. You can also find out more about what Alpha is and how it can change lives at the Alpha website.